Solid wood flooring is always installed in strips, which may be of varying lengths and widths, stanard wood floors can be stapled or glued. In addition, the strips are available in thicknesses ranging from 5/16" to 3/4" and in widths ranging from 2" to 8". Wide strips, called planks, range from 3" to 8". Parquet floors are made of strips laid in irregular, formal designs; these floors reveal the full range of the chosen wood's colors and create a highly patterned floor that is often appreciated for its simple beauty without the addition of rugs. While hardwood is usually preferred for restoration and new construction, engineered and laminated flooring has some advantages in certain situations. It can be glued down or floated in above an irregular surface, making it ideal for basements and damp or humid areas. It is constructed of composite board with images of distinct wood species embedded in its surface and is prefinished with a highly durable finish. It is constructed over 3-5 layers of plywood and the real wood on top. The advantage of Engineered over Laminated is that it can be refinished several times. Over 20 unique species of domestic and imported hardwood are used for flooring, each with a distinctive tone and texture. Among the most popular are Red Oak, White Oak, Maple, Pine and Hickory/Pecan. Beautiful durable floors are also frequently constructed of domestic Ash, Beech, Black Cherry, Douglas Fir, Walnut. Where a unique or specialty floor is desired, decorators and homeowners often choose from a range of imported hardwoods such as Brazilian Cherry, Australian Cypress, Teak, or Mahogany as well as lesser known woods such as Padauk, Wenge, Merbau, Purpleheart, and Bamboo. 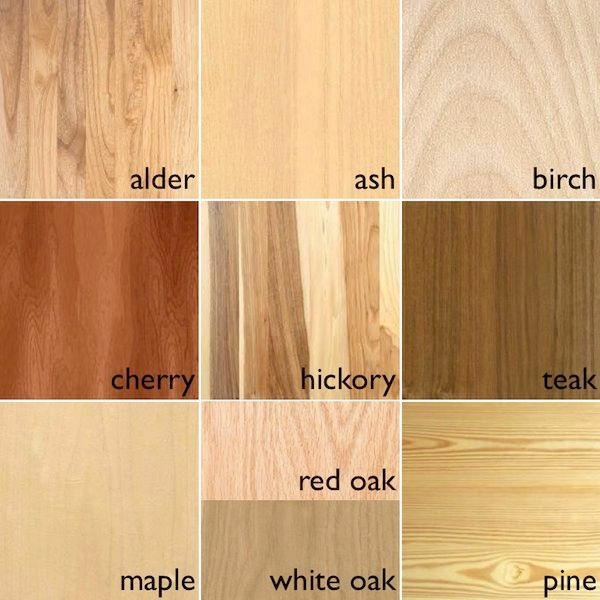 Every hardwood species has its own characteristics. In addition, every board has unique traits that are derived from the tree it came from. The professional selection and aartistic combination of these traits produces a solid floor with a range of natural variations that testify to its organic composition. The grade assigned to the flooring reflects its surface appearance. Strength and other structural qualities are uniform within a species and are independent of Grade. Select has fewer markings than Common. Clear has almost no knots or flags and displays uniform color throughout. Common Grade 1 exhibits fewer knots and other distinctive markings than Grade 2 and is also considered informal. Common Grade 2 is used for rustic, sporty interiors; it contains all of the natural markings found in the species, such as knots, flags, color variations, and worm holes. One of the most important factors in the final appearance of a floor is the cut of the boards. The most common cut is plainsawn, which reveals the tree growth rings and other variations. Plainsawn is the most economical choice because it can be produced with little waste. Quartersawn, while somewhat more expensive to produce, tends to wear more evenly than plainsawn as well as lying flatter and resisting twisting. Similar to quartersawn but with a slightly different angle and appearance is riftsawn.